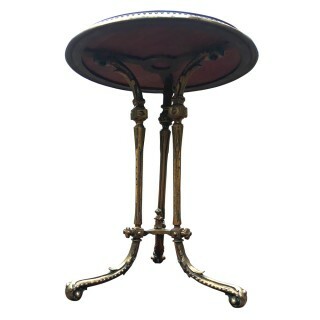 This is a beautifully designed and rare antique lamp or conservatory table is made from cast brass which has been gilded to add gold to the surface. 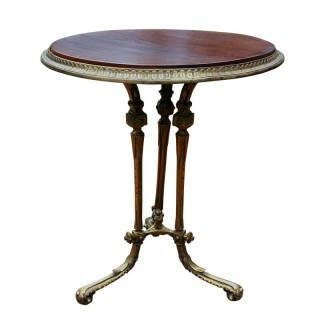 It is a very good quality, heavy weight table which would look equally good in a sitting room as well as a conservatory. The casting is very detailed and some of the original gilding remains in despite its age. 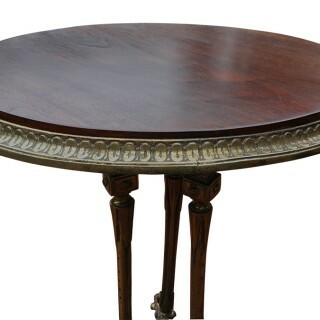 The table has a circular polished, beautifully figured, walnut top. This is surrounded by a decorative brass border with an oval design. 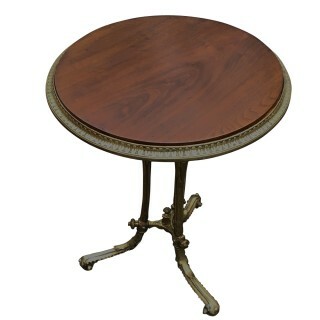 The table stands on three fluted brass legs with well cast decorative design. The ornate joining stretcher is equally well cast with decorative fluted knobs. Very good antique condition. Sound top and legs no damage. Some ormolu has been worn off.